Teaching…Again. What Is It Like to Teach after a Long Absence? I like to keep busy. Teaching semester-after-semester keeps the momentum going, but then something happens that forces me to sit out for a semester or more. Usually, we move. 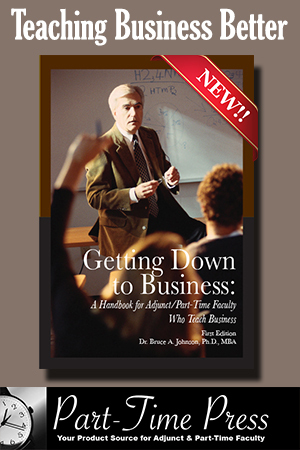 As I mentioned in my blog “Who Gives Up a FT Job to Become and Adjunct? Well, Me,” as an Adjunct By Choice and a military spouse, I have sometimes had to sit out of teaching because of the timing of our moves. So what is it like to come back to teaching after a lengthy absence? First, there is some difficulty of getting back on track and used to the teaching schedule. I am not referring only to the teaching schedule, as in when and where my classes are, but also the grading schedule, the reading the course materials schedule, the pre-semester prep schedule, and so on. You know that saying “going from zero to sixty…”? That’s what it feels like. Literally, you go from doing nothing to doing everything all at once. Well, not really nothing since I do have another job, but I go from absolutely no teaching to teaching every day. Then, there’s the wondering if you even remember how to teach. Is it like riding a bike? Can you pick up where you left off? Of course, that’s silly, particularly for me and anyone else who keeps everything. When I am not teaching, I wonder why on earth anyone would keep old syllabi from several years and colleges ago, old handouts, old rubrics, and all sorts of teaching materials. When I was a teen, my mother used to call me a “pack rat” for keeping things. Maybe she was right, but I still keep things I think might be useful sometime in the future. So what do I do when it is time to start teaching again? In whatever time I have before my class starts, I frantically dig out all my old supplies and start to reacquaint myself with the Adjunct By Choice in me. At some point, while swamped with grading and so many other things, I begin to wonder why I choose to keep returning to the college classroom and have to remind myself. Well, I like the teaching part because I find the exchange of ideas exciting, and I like hearing and reading what my students have to say, even if I may have heard it a hundred times before (because, let’s face it, there are only so many ways to discuss reading and writing) since it shows that they are thinking and learning. That is what I miss the most when I have to take a break from teaching, and that is what keeps bringing me back. That is the reason I am an Adjunct By Choice. And just when I think I am crazy for continuing along this path instead of jumping off at the next stop, I get an email or a note or even one of those anonymous student evaluations that says, “Thanks, Mrs. McDonald, for a great class!” That’s when I know this Adjunct By Choice is really back in the swing of things. About the Adjunct: Melissa McDonald is an adjunct instructor, writing consultant, and a military spouse all rolled into one. She earned a BA in English from Nicholls State University and an MA in English from the University of Louisiana at Lafayette. 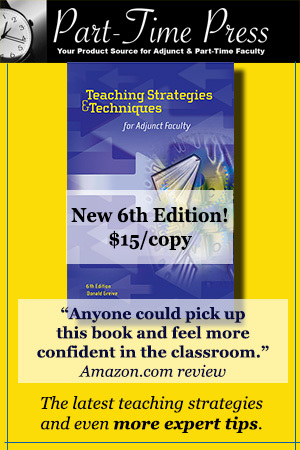 She has taught composition, technical writing, and literature courses, both face-to-face and online. 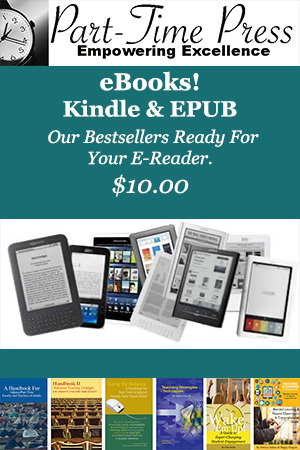 She also has experience as a journal and a newsletter editor, a webmaster, and a writer. Outside of work, Melissa enjoys spending time with her family, playing with her cats, reading, writing, and cross stitching. 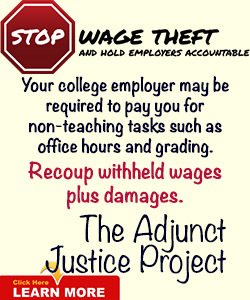 Are you an Adjunct By Choice? Would you like to share your experiences with other part-timers who teach because they want to do so? We’re looking for bloggers. To be considered, send a 700 word sample blog (something that you think would be perfect for this audience) to editor@adjunctadvocate.com. If your sample blog knocks our socks off, we’ll be in touch. What Should Grades Really Measure?